We’re starting the week off right. With cake. This was my fourth time making this cake. I made it for a birthday party and people freaked out. I brought it to a potluck and as I carried it in, people were chasing me down in the parking lot to ask what it was. I made a cupcake version for my co-workers at Christmas. A few people actually turned me down at first, noting their diets, their schedules, their willpower, blah, blah, blah. However, once the moans of ecstasy started echoing from everyone else, those same people tracked me back down to take a cupcake after all. Willpower be damned. More recently, one of the cupcake tasters at Christmas requested that I make this cake for her daughter’s birthday yesterday. I was happy to oblige. It’s a bit more challenging to make but a total showstopper. Three layers of the moistest chocolate cake ever with two thick layers of peanutty nougat, coated in creamy caramel frosting with a thick layer of chocolate poured on top. I have made a ton of cakes and I don’t know that I’ve ever seen one executed so well. Every component marries perfectly to make this gorgeous cake taste EXACTLY like a Snickers bar. Don’t bother buying anything for your Valentine this year. Just make them this. Preheat your oven to 350 degrees. Grease and flour three 8 or 9 inch round cake pans and line the bottoms with parchment. Set aside. Put butter in a small saucepan and melt over medium heat. Add milk and sugar, and stir until sugar dissolves. Bring mixture to a boil, then reduce heat and cook for 5 minutes, stirring frequently. Remove from heat and add peanut butter, marshmallow crème and vanilla. Mix well and stir in peanuts. Cool nougat to room temperature before filling the cake. Beat together butter and cream cheese until light and fluffy. Add caramel and mix until combined. Add powdered sugar. Turn mixer on low until sugar is mixed in and then beat on medium until creamy. Place chocolate in a small mixing bowl. Bring cream to a boil in a small saucepan. Once cream starts to boil, pour it over the chocolate. Let it sit for two minutes and then whisk mixture until smooth. Set aside to cool until thickened but pourable. Lay one cake layer down and spread half the nougat mixture on it evenly. Add the second cake layer and spread on the rest of the nougat. Lay the third cake layer down. Spread entire cake with a thin layer of frosting and pop it in the freezer for 15 minutes (or the fridge for 30 minutes) to firm up the crumb coat. Finish frosting the cake, concentrating it on the sides because the top gets covered in ganache anyway. Make the frosting as smooth as possible. Take your ganache and pour it over the top of the cake, turning it if necessary to help coax the ganache to drip down the sides. 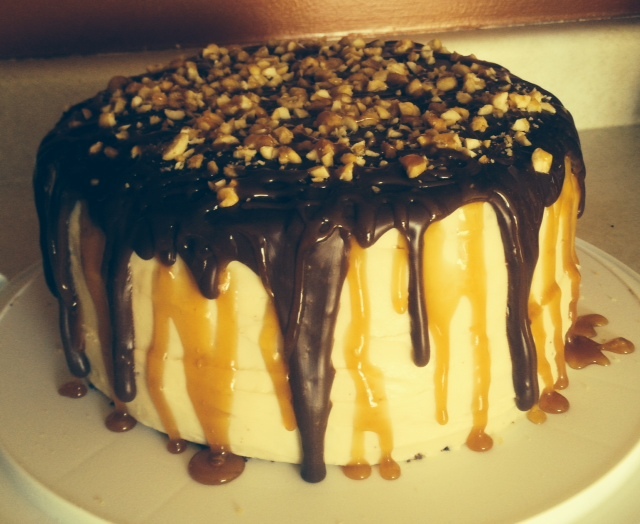 Once ganache is poured, garnish with extra caramel sauce and sprinkle the top with more chopped peanuts. Keep cake in the refrigerator until needed, taking it out about 20 minutes prior to serving.